The only body panel that the 2015 Camry shares with past models is the roof. It's design is brand new. With a four-cylinder and a V6 engine to choose from, the Camry is able to meet a range of needs. With a 2015 IIHS Top Safety Pick+ rating, there are no vehicles quite as safe as the Toyota Camry. Space for five and a great deal of cargo helps to make the Camry comfortable at all times. Much like the other Toyota models in the lineup, the Camry comes standard with a variety of appealing features. When equipped with the four-cylinder engine option, the Camry is able to travel 35 mpg on the highway.. Although the latest generation Camry was only just released in 2011, Toyota has already given it a significant number of tweaks, and the product of those changes is the 2015 Toyota Camry, which is one of the most stylish and capable vehicles in the Toyota lineup, and in the market in general. Here at Tuscaloosa Toyota, the Camry continues to gain a great deal of popularity for a number of reasons. We will break down those reasons for you in just a moment, but before we do, we believe that it's worth noting that we have a great deal of models of the 2015 Toyota Camry near Tuscaloosa, AL, and if you have been looking for the opportunity to not only learn more about the sedan, but to test it out for yourself, there is now nothing that stands if your way of doing so. To prepare you for the day that you come in and test it out, however, let's take a closer look at some of its capabilities. It all starts with the design. As we mentioned earlier, the Camry has undergone a number of changes, and that is especially true when it comes to the exterior. The only body panel that the 2015 model of the Camry shares with its predecessor is the roof. Every other panel from front to back has received changes to set the new model apart. The results are an undoubtedly attractive, bold new model with looks that more accurately mirror the sporty performance that the sedan is capable of delivering. Although the exterior of the 2015 Toyota Camry is one of the most appealing highlights of the new sedan, there is no arguing that its engine options are equally as appealing. That is especially true if you opt for the available 3.5-liter V6 engine, which generates an exhilarating 268 horsepower and 248 lb-ft of torque, but also has the ability to travel as far as 31 mpg on the highway. If it's fuel efficiency that you're after, you'll find it in the four-cylinder engine, which comes as standard equipment in all trims of the Camry. The engine allows the mid-size car to travel 35 highway miles on a single gallon of fuel. When it comes to safety, the Camry is once again a stand-out performer. It was recently subjected to a range of rigorous safety tests by the Insurance Institute for Highway Safety, and was able to secure the highest-possible Top Safety Pick+ rating, making it one of the safest vehicles currently on the market. If keeping yourself and your passengers protected is at the top of your priority list, there are no better options that the Toyota Camry. 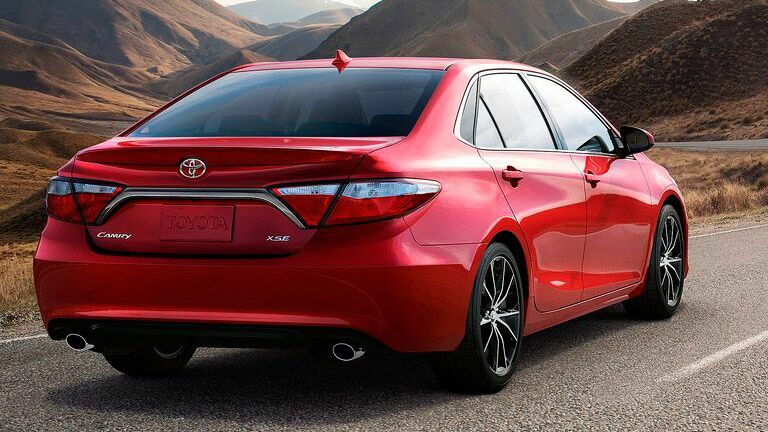 To learn more about the 2015 Toyota Camry, we encourage you to get in touch with us here at Tuscaloosa Toyota. As we said, we have more than enough of the midsize sedans in stock, and would be more than happy to personally introduce you to their superior capabilities. To schedule a test drive, simply fill out the form that we have provided here on this page. We look forward to hearing from you. Also, be sure to check out our no-cost non-factory Lifetime Warranty, which extends the standard Powertrain Warranty for any new Toyota model.